Jamie Collins, 24, is now working for UKSA as a watersports instructor – which is something he never would have predicted this time last year! Jamie came to UKSA through a referral from JobCentre Plus, who recommended the Aweigh Ahead course, one of our successful Back to Work engagement programmes. Jamie had only had a few casual jobs and wasn’t convinced the UKSA course would be for him. When he started the course he found it really fun and thought the environment was positive and friendly, but he said at the time: “At the moment there’s such a lot of information to take in, I don’t know what the future holds.” It gave him something to think about but he still wasn’t convinced his future lay in watersports. Over time he got more drawn into it and he heard about UKSA’s Watersports Instructor Training Diploma, which was fully funded. It was the springboard he needed to finally say yes, he did want to take control and launch a new career. 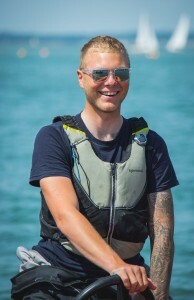 He was accepted onto the course and commuted daily for 12 weeks from his home in Newport, qualifying in teaching windsurfing, kayaking, dinghy sailing and Stand Up Paddleboarding. He spent a few weeks doing work experience at UKSA before getting employed as an instructor. Now he is on-site from 9am-5pm every day and is happy to be in a good routine, earning money which makes his home-life easier (he has a young daughter).